I love the opening of Animal Love Match. It sounds like you are climbing a hill and then the uncharacteristically loud guitars signal that you’ve reached the summit. As the panorama unfolds the distinctive melodic CTA sound kicks in promising something even more than what has been offered before. Assuming much deliberation went into the opening track for the debut full length, what were your deliberations on executing a proper opening? I imagine it is a good idea to read the press release before submitting questions. 18 months. Would you have preferred to have recorded in a shorter time frame or did this drawn out period of time actually provide unexpected benefits? I’m applying to be president of your American west coast fan club. As it turns out, it is the one physical EP I don’t have. Even worse, I just realized that I’ve never heard ‘Late in the City’ as my emusic download has duplicated ‘Country Song’ in the data file. You wouldn’t have any more hidden under a couch cover would you? Some bands are content to recycle their material or, shudder, re-release an entire album. You’ve amassed an impressive back catalogue of songs and it would have been perfectly understandable to include a few more gems. Other than the two you decided to use, were there any that were under consideration? A few years ago, I had to choose between seeing Teenage Fanclub or Bettie Serveert on the same night. What would you have done? How do I go about seeking absolution for going Dutch? The thing I’m most astonished by after the first listening of the new record was how you’ve progressed. There has obviously been a good deal of maturation and development in the time since the first EP. What are you particularly most excited or happy about? Songs about love must be difficult to write without staying between the same worn lyrical goalposts. Do you maintain a lyric notebook? Are you inspired by things you hear? This interview would mark our own one year anniversary. Do you place much stock in such things? (anniversaries that is; not the stupidity of blogging about Scottish music from 5000 miles away). My playing does not merit possession of these relatively modest guitars. My rack contains: Alvarez MD60, Ibanez AEF-37E, Epiphone Sheraton 2, Fender Aerodyne Telecaster, Fender Fat Stratocaster. If you had to limit yourself to five guitars what would they be? 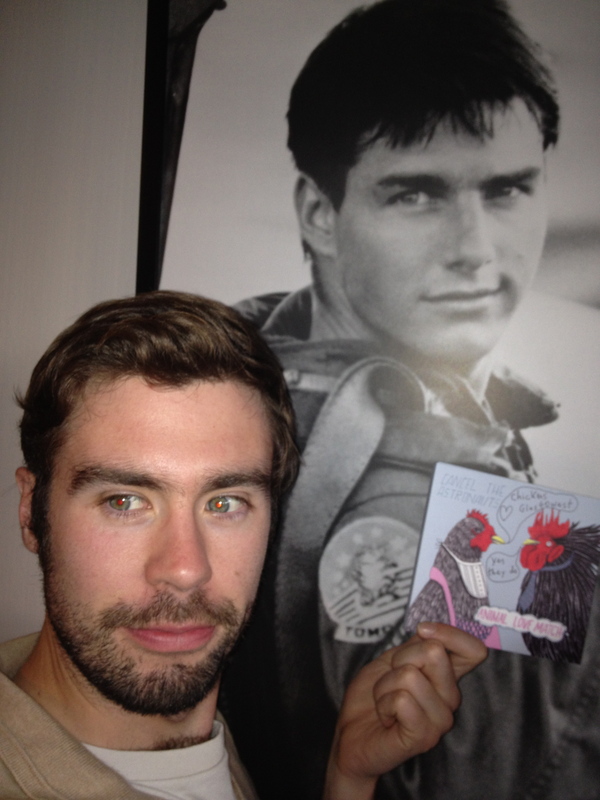 I’m so excited about seeing Admiral Fallow next month in a little club down the street. The most frustrating thing of my extraordinary awareness of upcoming Scottish bands is not actually getting to see any them. Now that your about to take Scotland by storm, have you cast your gaze at the North American market yet? ‘Lekking’ in the chorus – especially the line ‘who shouts the loudest’ reminds me of Tim Booth’s vocals. I imagine it has a lot to do with the length and cadence of the words. I’ve frequently read references to Pulp and would like to add that in the more contemplative songs you evoke James. What were you listening to in the 1990’s? I’m not so patiently awaiting my James Yorkston boxset and State Broadcasters CD and matchbox moth. Is there anything you are looking forward to on the musical horizon? Now that the album is out, what do you see on the horizon for Cancel the Astronauts? Although the world doesn’t need another record review – here goes. I’ve always placed a good deal of importance on the opening and closing songs of an album. 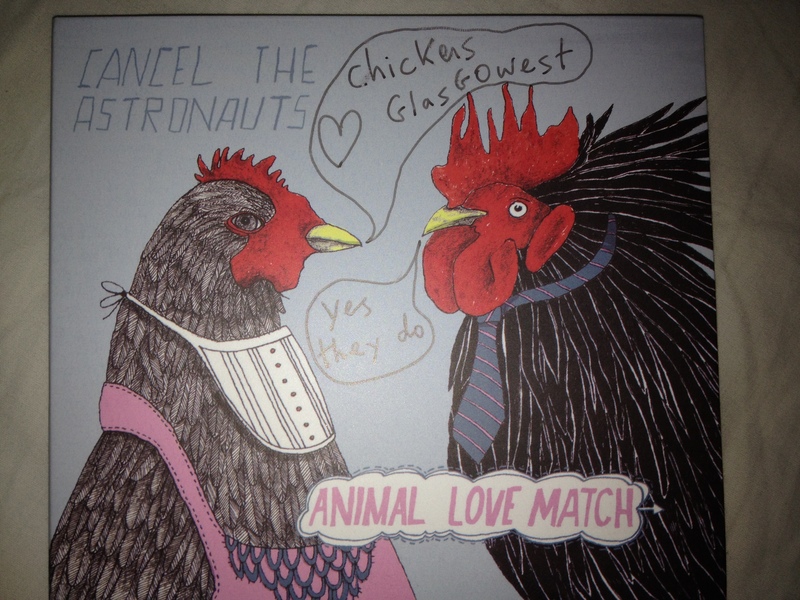 The titular ‘Animal Love Match’ starts off with a slow expansive keyboard fill while repeating the song title. Soon after, an uncharacteristic guitar assault signals that this is not your typical Cancel the Astronauts song. After a two minute prelude, which is incidentally two thirds the length of almost all the other offerings to date, the two streams of sound coalesce and the familiar melodic onslaught of CTA commences. It invokes the anticipation that this record will take CTA to a whole new level. A previous single and second song ‘Seven Vices’, in many respects, is the embodiment of the typical CTA song: strong driving melody; playful lyrics and even though I imagine that Mr. Riley doesn’t consider himself to be a singer; his voice is self-deprecatingly evocative – A less sardonic Jarvis Cocker. I have to admit I’ve find the auto-tune treatment on the opening of ‘Intervention’ somewhat annoying. Seeing the video of the song played live without it in the Rockhopper at GoNorth reinforces how good this song actually is. Comparing the live version with the recorded one, I’m left feeling this is the one song that has suffered from a little too much time in the studio. Flipping back and forth between the two, I prefer the slightly sparser, wider open vocal dynamic of the live version. CTA wisely use both of the two songs they’ve recycled from the back catalogue right at the beginning. Since Animal Love match seems as much a statement of intent as a song proper, it is the remaining nine songs that give a clear understanding of the overall maturation of their sound. Love backwards – Evol- the Manic’s Revol instantly comes to this mind. This is another song about love that somehow manages to tell a familiar story in an engaging way. The endearing thing about Riley’s vocals is their innocent sincerity and how nicely they mesh with the chiming ringing guitars. ‘Making Dynamite’ Is a great tune; it reminds me very much of my now defunct local favourites ‘elephone’. ‘Lekking’ starts out with a keyboard swirl, a singular guitar and vocals that are reminiscent of Tim Booth. This becomes most apparent during the refrain “Who shouts the loudest“. Of course, the James comparison might just come to mind because of the lyrical choice of a monkey. With the quieter and contemplative ‘Shapes’, you also can’t but help hear the James comparisons. There is a much greater purposeful conscious vocal range evident however. The similarity with the pacing and cadence of the words might account for the comparison. Perhaps it is really just a matter of emotionally reacting to that particular delivery; regardless of where it originates it is emotionally appealing. There is nothing derivative about the vocal delivery. However, I am curious how someone who has not been immersed in James since the 90s would react to those songs. Is this the best record I’ve heard all year? No. One does get the sense though that the best is yet to come. So many bands having perfected their sound by the first album, find that it really is only a matter of time before they gradually drift away from the very thing that sets them apart from the rest. CTA seems like a band that hasn’t yet reached its peak. This, although it might not sound like it, is a high compliment. There is so much more potential depth in their apparent musical approach; the very thing bands struggle with for the sophomore record. Although it is a bit early to be wishing for one the day of the debut release, I can’t wait to hear the next one. All in all, this is an excellent record that should be in your Scottish music collection; perhaps for no other reason than that CTA have striven to create a record and sound that eshews the current Scottish musical sensibilities.